Class will meet in 2 two-hour sessions that are 2 weeks apart. This will give you time to work on your collage at home. During the first session we will go over Laura's pattern directions together in class and trace the pattern on Pattern Ease with a pencil. Value, Color, and Fabric Motifs are very important to this process so we will spend some time looking at and sorting various fabrics. Collage quilts use many small pieces of lots of different fabrics. Some will be no larger than 2" x 2", so it is not necessary to bring yards and yards of fabric with you. I suggest bringing fat quarters so you can select areas of the fabric and trade pieces with classmates. It would be helpful to pre-cut about 20 4" x 6" pieces of fabric from your fat quarters before class. During class we will begin to place underlays and a few motifs to get you started. You will not need to bring a sewing machine for this session. Your own iron may be very helpful. 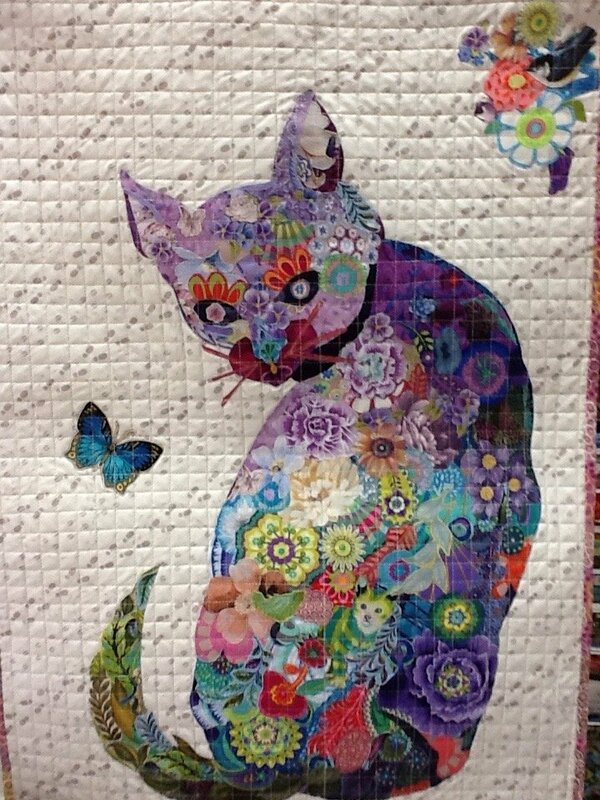 On your own between sessions, continue to cover the pattern with fabrics to complete the collage. A design wall is a must. It can be as simple as a flannel backed tablecloth or piece of flannel thumb-tacked to a wall. Steam A Seam 2 has a temporary adhesive that allows you to move colors and motifs while you are working. When everything is in place exactly the way you want it, a hot iron will make it permanent. When we return for Session 2, we will look at the completed collages together. I found it helpful to step back from the work at this point and have others look at it with me to be sure the values, colors and motifs are working. If we are ready, we will iron the collage to make it permanent. Then, it's time to cut out the animal shape and attach it to the background. Additional fabric motifs can be added to the background. A sewing machine will not be needed unless you want to piece your background or will be ready to machine quilt the quilt sandwich. Materials Included: I will provide some scraps of fabric for sorting and practicing with Seam A Seam 2. Requirements: Pattern by Laura Heine along with supplies listed on the pattern. I found 100% cotton fabric scraps as small as 4" x 6" to be perfect for this project. Look for patterns with flowers, fish, birds, leaves, lines of movement, circles or other shapes that you can easily cut out and use to build your collage. You will also need a few that are tone on tone for underlays. Steam A Seam 2, a pressing sheet and an iron are absolute necessities. A design wall is very helpful for this project. Good scissors for cutting small details as well as scissors for cutting paper. A rotary cutter and mat are necessary if cutting 4" x 6" pieces in class. A sewing machine will not be needed for Session 1 but is optional for Session 2 depending on how far along in the process you are between classes and if you choose to piece your background. Instructor Bio: Linda Nowak - linwak@gmail.com After completing one of Laura Heine's quilts (Hazel Nutt) I created my own collage quilt from a photograph. In a prior life I was a K-6 Art teacher. I have been quilting since 1982. I like to try everything at lest one: hand quilting, English paper piecing, t-shirt quilts, applique, machine quilting and more.